What type of dewatering/drying system is best for you? It depends on your material. 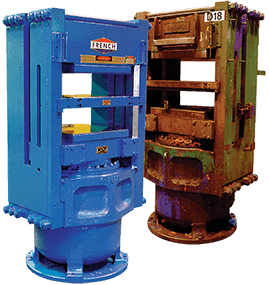 Our Polymer Group supplies a full line of mechanical presses and systems for all three types of processes. You will step up to the best solution when you add French’s years of multi-application know-how to your team. If it takes custom modifications to standard equipment or a special solution, we can give you optimum process results. Get the facts and objective recommendations from the team with the most solutions. Contact French today to discuss your application or request a free product bulletin below. The graphic below describes the three processes French uses to provide the best system for your application. To learn more about the French machine that is right for you, click the orange links below in the appropriate process.